StoneLok™ E3/2K2 Kits are water-based (food safe), unmatched stain resistance (coffee, wine, soda, vinegar, citrus, Tabasco, acetone, gasoline, Clorox and more), unbeaten abrasion resistance, 400 degree heat resistance, available in gloss and satin(XLG) finish. This system is also widely used by homeowners around the world. TK6 NanoCoat and StoneLok 2K2 products must be shipped overnight to arrive safely without freezing. When ordering, please select FedEx Standard Overnight to ensure your order will ship out as soon as possible. Orders placed with Ground shipping will be held until warmer temperatures allow for safe shipping. *** Please download our StoneLok Kit Outline & Application Tips with Application Instructions by clicking "Download Fact Sheet" to the right. *Coverage may vary due to porosity and texture of substrate. This StoneLok E3/2K2 System is great for concrete countertops and floors, or any prepared concrete or masonry surface that high levels of stain and abrasion resistance are necessary. Please read ALL instructions before use to familiarize yourself with the application process. If you have any questions, please contact us at 614-754-4777 to speak with a technical advisor. Prepare: Surface should be clean, dry, and have a surface profile at least as rough as a 200-300 grit sand/grind. Dilute and apply O-S/W Substrate Conditioner. Allow 45-60 Minutes to dry. Mix and apply StoneLok E3 Epoxy Primer according to included instructions. Allow at least 8-12 hours at 70 degrees F. Before moving on, E3 should be dry to the touch. Mix and apply StoneLok 2K2 Urethane Topcoat according to included instructions. Allow 5-7 days at 70 degrees F to reach full cure and full resistances. Colder temperatures and/or thicker than normal applications can slow cure times. Application tools are not included in the kit, so you will need either a sprayer or a roller and roller covers to apply the coatings. If rolling, we typically recommend nap roller covers that are 1/4“ - 3/8“. Foam rollers have a tendency to produce bubbles in the coatings. You will also need: clean mixing containers, a power drill with a low speed setting and a drill mixing blade. Dropcloth and tape can be used to mask areas off around the application area, but painters tapes should never be used over the coatings as solvents in adhesives can often damage coatings. What are the temperature and humidity constraints for applying the StoneLok E3/2K2 System? What about for the curing/drying period? Recommended application temperature should be close to 70 degrees F without varying much during the curing process (4-7 days). Humidity should be less than 60%. Colder temperatures can slow down and even stop the curing process. High temperatures can accelerate the pot life and curing process. Which product do I apply first? Typically the OS/W substrate conditioner is applied first (after diluting with water) and is wiped on. Once dry (typically 30-45 minutes), the StoneLok E3 epoxy should be mixed and applied according to the directions. After letting the StoneLok E3 epoxy cure for 8-24 hours, the StoneLok 2K2 urethane is the final component you will apply. Please download the application packet for a full outline and product instructions. I ordered an Extra Low Gloss Kit, why did I received StoneLok E3 - Gloss? StoneLok E3 is only available in Gloss, there is no alternative. When topcoating with StoneLok 2K2, the final finish of the surface is determined by the finish of the StoneLok 2K2 Urethane. During purchasing, selecting a finish will designate which version of the StoneLok 2K2 topcoat you will receive in your kit. StoneLok 2K2 is available in Gloss (high gloss finish), Low Gloss (semi gloss finish), and Extra Low Gloss (satin finish). How do I prepare my concrete before I start my application? We recommend that the surface is fully cured and dry (no trapped moisture), clean and free of contaminants, and that the surface profile is at least as rough as a 200-300 grit sand or grind. Sanding or grinding typically exposes new, clean concrete that is free of contaminants. After sanding or grinding, wipe the surface with acetone or a 50/50 acetone/water solution to remove dust from sanding. Once the surface is clean, dry, and adequately rough, you may begin your application process. How long do I have to let my concrete cure before applying my StoneLok Kit? Your concrete surface must be fully cured before applying the StoneLok Countertop Kit to ensure that no moisture is trapped during the coating process. Full cure times are dependent on the type of mix you are using. Please refer to the manufacturer of your mix for information on concrete curing times. Countertops generally cure much faster than floor slabs as they are thinner and can cure from all directions (approximately 2 weeks). Do I have to buy the products in a kit, or can I purchase them separately? If you plan to use all three products, it is more affordable to purchase them in one of our square footage kits. If you do not need all three products for your application, or simply need more of only one or two of the products, we offer them separately as well. However, StoneLok 2K2 should not be applied as a stand-alone product as it typically requires a suitable primer for adhesion. Are StoneLok Kits only offered in clear or colors? The StoneLok Kits are offered in Clear on our website, but the StoneLok E3 and/or StoneLok 2K2 may be tinted as well. This option is only available for customers to order over the phone as we must communicate with the manufacturing location to determine if color trials are necessary for the desired color. If color matching for the specific color has been completed previously, color trials should not be necessary and we would only charge for the cost of the dye (approximately $10 - $50 per unit for 1 Gallon of coating). If color matching trials are necessary, 1-3 are performed for $50.00 each, and cost is passed on directly to the customer with no upcharge. Please give us a call at (614)754-4777 if you would like to discuss color options for the StoneLok E3/2K2 System. Do the kits provide color enhancement or Gloss? What are the shelf life and storage recommendations for StoneLok Kits? StoneLok Kits have a one year shelf life when unopened and properly stored without freezing. After opening, shelf life is diminished and kits should be used within one month. A dry gas blanket may extend shelf life after opening. Can I use my StoneLok Kit for an outdoor application? Can it be applied outdoor? StoneLok Kits are UV stable and great for outdoor use, but generally are not applied outdoor as the application constraints are hard to maintain for the full curing period (4-7 days). If applying outdoor, temperature and humidity must be controlled, and the coatings must be protected from damage for the entire curing process. How long will my StoneLok System last? StoneLok E3 and StoneLok 2K2 have the highest abrasion resistances available for their respective categories (epoxy, urethane, etc.). With normal use and proper care, the StoneLok System will typically last many years. In addition, a refresh coat can be applied at any time. A light sand with 200-300 grit provides great mechanical bond for the adhesion of another topical coating. How do I dispose of leftover StoneLok? 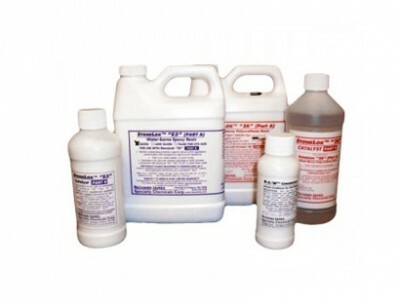 If mixed and allowed to solidify completely, products can be disposed of normally. Please refer to your local authority to ensure accordance with local, state, and federal laws.